Visit of Smt Patibha Patil, the President of India, in connection with Birth centenary celebrations. 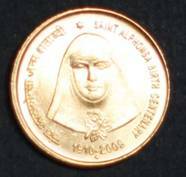 Birth Centennary of St. Alphonsa is celebrated at Bharananganam with release of commemorative coins of Rs. 100/-and circulation coins worth Rs. 5/- by Sri. Pranab Mukherjee, the Finance Minister.